At Vigil Truck & Bus Repair, we can arrange for towing, perform all collision repair from small dents, fiberglass repairs, repairs to cab panels and even hood-cab and sleeper replacement. 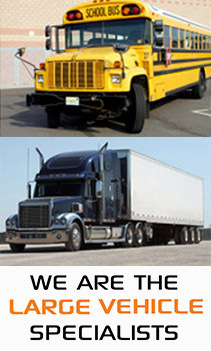 Vigil Truck & Bus Repair can work on your owner operator trucks or fleets of any size. We can handle any of your collision needs in a timely fashion. We can do any custom work ranging from custom narrow hood, to chopped cabs/sleepers, custom fabrication of visors, stacks, fenders and anything you can dream, we do. We look forward to assisting you when in need of collision or repair service.